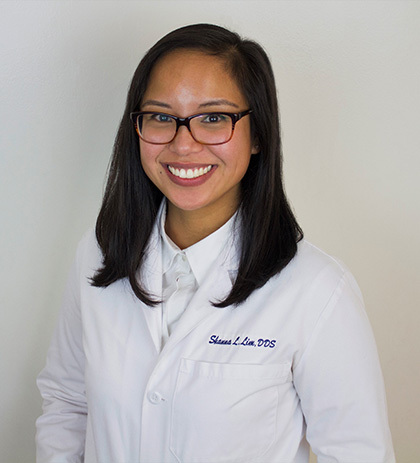 Dr. Shanna Lim - George Lim Dental, DMD, Inc.
Dr. Shanna L. Lim graduated with her Bachelor’s Degree in Biology from CSU Long Beach and then received her doctorate from Howard University in Washington, DC. She has been practicing dentistry since 2016. Although Dr. Shanna is a relatively new graduate, she has been working and learning in the dental field alongside her father, Dr. George D. Lim, for the past 13 years. Together, they have volunteered in dental missions in the Philippines and worked with many different patients here in LA. Dr. Shanna is an active member of the West Los Angeles Dental Society, California Dental Association, and the American Dental Association. Outside of the dental office, Dr. Shanna enjoys trying new things and traveling as much as a relaxing day at home. With her friendly chairside manner and a fresh view of treatment techniques, she aims to deliver conservative, sustainable, and quality dentistry.